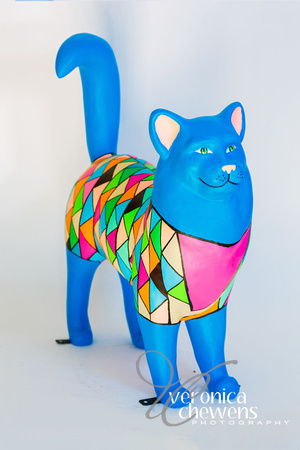 Description: “Gem of a Cat” is a brightly-colored piece, with gem-inspired shapes a lot the cat’s torso. The cat’s head tail and legs are a soft lavender. It is a whimsical cat. 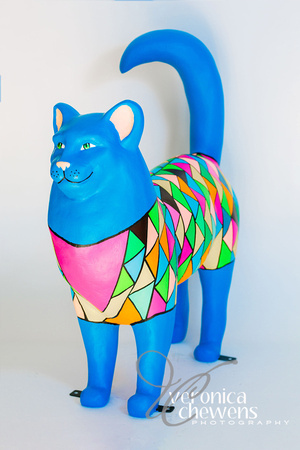 About the Artist: Liana Lekocevic is a high school sophomore at the Doane Stuart School. She is an avid artist who has won Honorable Mention for the Northeast Region in the prestigious Scholastic Art and Writing competition, and her works have been featured online in “Teen Ink.” She sold a painting at a fall exhibition at the Thomas Cole National Historic Site in 2017, co-created an owl for Coxsackie’s “What a Hoot” Festival last year, and has exhibited works at the Athens Cultural Center and in student exhibitions in Albany and Rensselaer. Melanie Lekocevic is experienced in the performing arts and is making her first foray into the visual arts. This mother-daughter team loves working on art together!